A husband and wife team are hoping they have all the right ingredients as they launch their first business venture. Geoff and Leanne Cromby have taken over the franchise for Subway, in Ocean Road, South Shields. We are both looking forward to seeing what the future will bring. 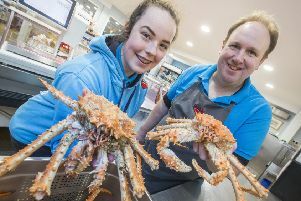 The couple, both from South Tyneside, opened the doors as new owners last month after several months of work behind the scenes. The Mayor and Mayoress of South Tyneside, Coun Richard Porthouse and wife Patricia, visited the sandwich shop to wish the couple and the team well. Mr Cromby, an electrical engineer, said: “We have been planning this for a while but with all the paperwork it has taken several months for us to actually take over the franchise. Since the couple have taken over, Leanne, who was a catering manager at a residential home, and her husband have introduced longer opening times and breakfasts. Mr Cromby added: “This is in an ideal location. Since we have increased our opening times, we have already seen an increase in trade. “We are also seeing a lot of people coming over from the leisure centre as we have salads available too. Coun Porthouse said: “I was delighted to be invited to officially re-open this town centre business. Subway offers a great choice of hot and cold sandwiches as well as other snacks. Subway is open from 7am until 9pm and serves breakfasts as well as a range of sandwiches.